This page is for the original 2001 version. For the 2015 re-release, see Worms World Party Remastered. It is possible to set any screen resolution for the gameplay environment up to 32767x32767 through the ReSolution plugin. Letterboxing starts at sizes greater than 6012x2902 for open-island maps, and 1916x854 for closed-cavern maps. Multi-monitor support is possible by combining this plugin with the windowed hack and manually adjusting the total screen resolution in the settings file. In combination with the windowed mode hack it's also possible to optionally zoom the game (via the mouse wheel, keyboard or touchscreen) and be able to resize the game's screen real estate using the respective options. Alt+↵ Enter will optionally switch between borderless fullscreen window fill and a nonfullscreen window. It is possible to run Worms World Party in a window through a windowed mode hack, either with or without the window border (can only be enabled for the gameplay process). It will also perform an external conversion of the 8-bit palette to 32-bit, resolving the color issues on Windows Vista and 7, as well as improving performance on Windows 8 and newer. It can be combined with the ReSolution plugin to change the window dimensions during the game, independently of the GPU/monitor capabilities. It's possible to zoom and resize the game combined with ReSolution when using this hack. The "VerticalSync" setting, enabled by default, synchronizes the displayed frame rate with the monitor refresh rate. Details and download links can be found here. This is essentially the same as the wrapper-based compatibility fix mentioned above, just giving extra functionality to the game. To enable windowed mode, set "WindowedInGame" (for the gameplay process) and/or "WindowedFrontend" (for the pre-game menu screens) to 1 in the settings file. The game can crash with a "Worms World Party has stopped working" error and can show wrong colors on some Windows 7 and Vista machines. The game can also perform badly on Windows 8+ and display white forms instead of controls in menus. There are various unofficial fixes to these problems. A solution to the crashes, palette issues and Windows 8+ problems can be found here. 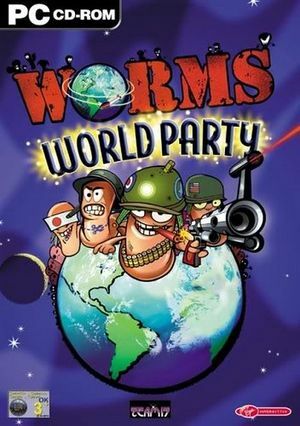 Download the archive on that website and extract it into your Worms World Party folder. It is compatible with all versions of the game, but make sure to remove all other fixes first to prevent any possible conflicts. The fix works by encapsulating the DirectDraw windowed mode wrapper to bypass common unexpected errors with DirectDraw initialization on Vista and later. The colour palette is converted into 32-bit color in real time, also eliminating the colour issues. Windows 8+ performance issues are fixed by this, as well as whiteness in input forms and when starting a game. There are alternative workarounds for the palette problems; see Rainbow color problems in older games for details. This page was last edited on 23 April 2019, at 11:58.